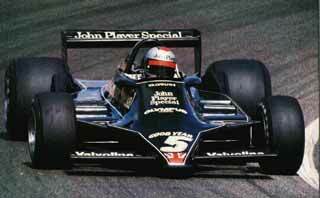 In 1978, Mario Andretti won the Formula One World Championship in Colin Chapman's JPS Lotus. 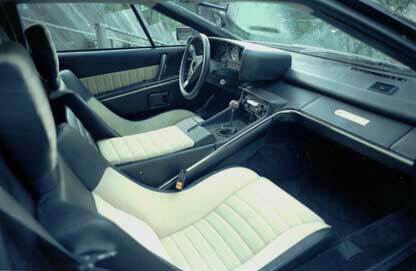 The car had a revolutionary ground effects design that breathtakingly swept the field. 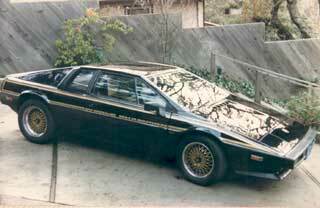 The next year, Lotus built a commemorative edition of 147 Esprits in the same John Player Special color scheme. Mario got the first, mine is the seventeenth. 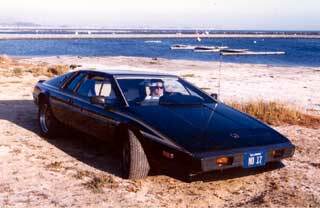 I bought the car in 1985 from a Formula Atlantic Champion in Laguna Seca, using my first royalty payment from Skyfox. I've driven it off and on for more than 20 years and still love it. King's Mountain Road and Skyline Drive are winding roads in the redwood forest nearby, and that's where my baby is right at home. After it's 25th birthday, my mechanic said he could really supe up the car, but that would make it a bit temperamental. Yikes! It doesn't need any more of that! I've heard that it was Colin Chapman's philosophy that the car should fall apart as it crossed the finish line. He built for that race and no more, therefore it perfomed as efficiently as possible. While this seems to have worked in racing, my car indicates that it's terrible for a street car. Why do the English drink warm beer? Because they have Lucas refrigerators. See Ken's Lotus pages for more. The net has quite a bit of information on Lotus Esprits, see the links to the left. The Giugiaro Esprit Page is particularly well done. My new favorite is Ian's, where he is collecting short histories from each of us at the JPS Esprit Registry.